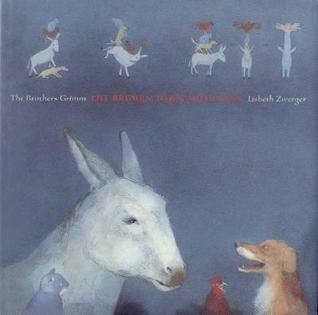 I first heard The Bremen Town Musicians as a bedtime story, and loved the idea of the animals running away together and how they won the day through teamwork. I can still sing some of the lyrics from the animated version of the tale. As a bonus, I was living in Germany at the time and became convinced the musicians were in the next town over. I recalled the story fondly, and reread while writing this post to refresh my memory. Oh my! I see the story from a completely different point of view now. The animals didn't run away for a better life or great adventure, like I'd believed as a child. In the original telling they were all about to be killed by their owners after years of loyal service because they could no longer earn their keep! Yeah, I grew up on a farm, but our old animals simply went into retirement, and I didn't recall that particular aspect of the story. I suppose that's par for the course for The Brother's Grimm. I'm going to try to forget I reread the story today, finding darkness in the familiar words that my younger self didn't comprehend. 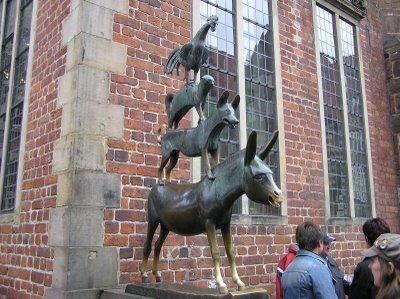 I choose to remember from a child's perspective, not the farmers' cruelty, but how loyal freinds can conquer any odds, and recall the statue erected in honor of this fable in Bremen, Germany. In my past posts I've revisited childhood stories and loved them anew, however, The Bremen Town Musicians leaves me with mixed feelings. The Brothers Grimm were well named. I had a copy of their Fairytales when I was a kid and couldn't understand why people loved Fairytales so much - until I saw the Disney versions! Hi Mara! Yeah, looking back, I recognized now how dark some of those stories were. And yet, they're still alive, well, and being retold.